The perilous camera-eye: El sexto sentido | The Sixth Sense (ES 1929) | Silents, Please! The camera never lies. This cliché is now so discredited that even its antithesis is something of a truism: images are almost infinitely manipulable, via both technology, context, and human interpretation. Ultimately, El sexto sentido puts stock in both the idea of the camera as truth-recorder and that of the fallibility of human interpretation; as one of the opening intertitles of the film states, “To know [the truth], we must add the precision of mechanics to our imperfect senses.” Yet as the film shows us, images without context are all too easily misunderstood. Meanwhile, the protagonist of the film, Carmen (Antonia Fernández), is having a picnic with her boyfriend Carlos, and their friends, the couple León and Luisa. Happy couple Carmen and Carlos are very cute together, and Carmen is delightful as she dances to the record the group is listening to. Conversely, León quickly establishes himself as the stick-in-the-mud of the group, disapproving of Luisa grooving along to the music. Chez Carmen, Carmen’s father (the character is not explicitly named) is upset that he can’t go to the bullfight. When Carmen arrives home, he sees the ring Carlos has given her—A ring is a link joining two lives, as an intertitle tells us—and flies off the handle, accusing her of loose living, and spending on her time on frivolities while he is working. His hypocrisy is outrageous, given that he does not work, while Carmen does have a job (as we are shortly to see), from which she gives all her earnings to her father. He even goes for the heavy-duty parental guilt-trip: “I gave you life!” In short, Carmen is browbeaten into going to sell the ring. She gets ripped off, and she is late to her rehearsal at the theatre. Carmen is a dancer in some kind of revue, and she can high-kick with the best of them—too bad, then, about the theatre director, who dresses Carmen down for being late and eventually gets handsy with her. Carmen’s father, at the rehearsal for some reason, is overcome with rage, kicking the director to the ground. He then evinces some compassion: “My poor girl! How you’ve suffered!” He vows to work for the two of them so that she never has to come back to the theatre again. I suppose this is meant to be the start of Carmen’s father’s redemption arc, but it’s hard to wash away the callousness of his earlier actions. Meanwhile, León and Carlos discuss their different natures: León tells Carlos, “You always see life through rose-tinted spectacles”, to which Carlos responds, “And you’re always too gloomy”. Who is right? León, whose most notable actions so far have been to tell off his girlfriend, disapprove of music, and grumpily drink a glass of milk while the others enjoy wine, decides that this conundrum is impossible to solve without the counsel of Kamus. The scene at Kamus’ place, however, is one of the most interesting in the film. Kamus shows León a variety of footage that he’s shot. This is seemingly included to demonstrate the dynamism of technology—or as Kamus describes it, “Madrid without literary defomation” (! )—and it’s effective. There are very appealing location shots around the city, as well as a prism shot that reminded me of Mikhail Kaufman‘s camerawork, though it’s unlikely that director Nemesio M. Sobrevila had seen The Man with a Movie Camera (USSR 1929) prior to shooting El sexto sentido. Kamus declares that the camera is much better than literature in evoking the sense of summer: it even feels refreshing! León is into it. Of course he is! He gets the sense of things without any of that messy business of, you know, real-life interaction. The camera provides mastery over the world: observation, capture, division, deconstruction and reconstruction. But not all of Kamus’ motives are so philosophical. He goes on to say that he’s seen “some incredible things. Without them knowing”. Ohhhh. Inevitably, the footage includes … wait for it … Carmen. Kamus has surreptitiously filmed her in her dressing room at the theatre, the camera lingering on her legs and calves as she changes her shoes. Shots of womens’ shapely ankles and calves are well-established in early and silent cinema: Edison’s The Gay Shoe Clerk of 1903 is often cited as an early example of the closeup, and an examplar of Tom Gunning’s ‘cinema of attractions’ theory. But the real goods are that we see Carmen meeting Another Man—yes, it’s of course her father—and money changing hands. Qué escándalo! The scenario where a person overhears/oversees something and draws the worst possible conclusion (in the face of many other, more likely explanations, and without any actual communication with the person concerned) was far from fresh even in 1929. This is one of my least favourite tropes, and honestly, even by the standards of this film, it’s pretty contrived. And here it goes hand in hand with one of the other worst tropes in fiction: people meddling in their friends’ relationships. Holy boundaries, Batman! But this situation is what the plot demands. León breaks up with Carmen on Carlos’ behalf, coldly informing her that Carlos “knows about yesterday” and doesn’t want to see her again. Thankfully, the resolution is relatively swift: Carmen’s Dad redeems himself (slightly) by beating up Kamus, and León’s “proof” of Carmen’s affair is resolved by an actual look at the filmstrip in question. The evidentiary power of film. The Spanish film industry was not highly developed in the silent era. While there was certainly homegrown filmmaking in the teens—some of which I’ve written about before—the Spanish film industry suffered from a lack of infrastructure and a solid industrial base, and few production companies lasted long. Cinema was extremely popular, especially in Spain’s film capital Barcelona, but it was largely imported films that filled the screens. And indeed, El sexto sentido looks outwards in several ways. 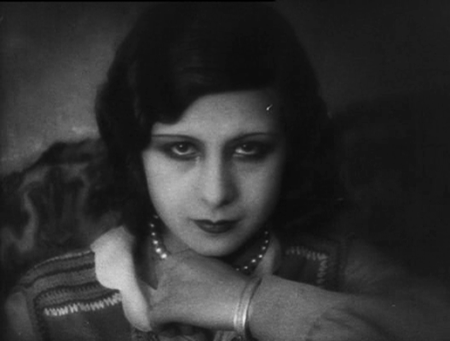 The character of Kamus reflects the debates of the 1920s about the nature of cinema; Carmen bears the influence of Hollywood in both her appearance and her job in an American-style revue; and the cinematography is clearly influenced by the techniques of the avant-garde. Madrid’s architecture seen anew … the Telefónica Building (left), Cine Callao (right). There is a judicious use of chiaroscuro throughout, particularly in the way that Kamus—technological alchemist, lecherous hobgoblin—is shot. Another of El sexto sentido‘s biggest assets is Antonia Fernández as Carmen, who brings a great deal of charm to her role. Given the nature of the character, Carmen is more to be looked at than to do the looking, but we do occasionally see Fernández deploy the power of her gaze; it’s welcome, even if it doesn’t counterbalance the way that Carmen’s body quite literally drives the film’s plot. It’s hard not to read Carmen as embodying tension around the role of women in society, punished by the men around her according to their whims. Yet, there’s another scene which I found particularly interesting in regard to the gender politics of El sexto sentido. The household of Carmen and her villainous father is motherless, yet we do meet a mother in the course of El sexto sentido, and it’s a bizarre and ambivalent portrayal. At his cinematic lair, Kamus has recently acquired a kid assistant: “Yesterday I snatched him from his mother”. Parallel to the Kamus-León conversation, there’s a nice bit of pantomime from the assistant in question: inspired by the illustrated Tom Tyler story (entitled El molino trágico) that he’s been reading, he acts out an armed struggle with himself, eventually jumping up onto the desk, ‘pistols’ drawn and ready. But more intriguing is the way that Kamus describes the mother-son relationship, pronouncing it “an interesting case of the deformation of maternal love”. The mother would apparently prefer for her son to return to his job in a bank than spend all his time with an aging drunkard/peeping-tom/philosopher. While this seems like solid parenting to me, Kamus disagrees: “She’s revealed herself to be a monster,” he sniggers. Intercut with the kid projecting film, we see the “maternal monster” appear; the mother-son argument, framed in tight closeup, is followed by her literally chasing her child around with a broom, before finally beating Kamus himself. The editing here suggests that Kamus, León, and the kid (as well as us, the audience) are watching footage of the mother preceding or even alongside her actual apperance chez Kamus. Primed by the scene showing the kid-assistant’s absorption into cinematic imagery, there’s an odd blurring of boundaries here. An unruly female character as disruptive force is nothing new, of course, but what does this scene add up to? Feminine, emotional intrusion into Kamus’ palace of “scientific truth”? A nod to the psychoanalytical mumbo-jumbo that was so in vogue in the 1920s? Certainly, it’s further proof of Kamus’ misogny; it’s a grand joke to him, who says that this is how he wants “this phenomenon” to be perceived. Nemesio Sobrevila, the director of El sexto sentido, was an architext by training. Wealthy, highly cultured, and an enthusiastic participant in film culture, Sobrevila began his film career in Madrid in 1927 with the now-lost Al Hollywood madrileño. 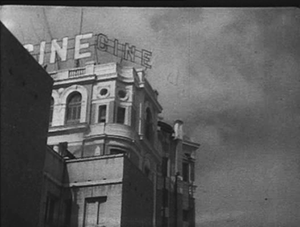 As with those of El sexto sentido, Al Hollywood madrileño reportedly enjoyed high production values, with the sets—constructed by Sobrevila—considered the best seen in Spain to date. Yet Sobrevila did not achieve commercial success with either film; El sexto sentido was screened just once commercially, though it was also screened privately several times. I wouldn’t be surprised if the film’s generally good condition is due to this lack of commercial exploitation, rather than restoration techniques. El sexto sentido had, however, a strange afterlife. It was released on DVD in 2003, but unfortunately—and inexplicably—the distributor botched the release by switching the order of the middle and last reels, making the film seem to be much more avant-garde than it is in reality. Rather than a work of true experimentalism, El sexto sentido is better understood as a work of meta-cinema that uses a conventional narrative to comment on film theory and play with a range of styles. El sexto sentido [The Sixth Sense]. Dir. Nemesio M. Sobrevila. Madrid, Spain: Sobrevila & Ardavín, 1929. El Sexto Sentido is preserved by the Filmoteca Española. A copy taken from broadcast is available on YouTube here. 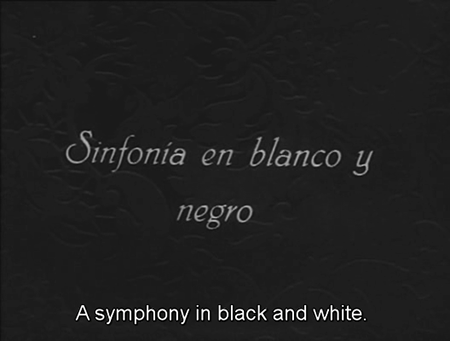 This entry was posted in Film and tagged cinema of 1929, cinema of Spain, film about film. Bookmark the permalink. I just watch it. Your synopsis helped me a lot since my Spanish reading skills are very limited. As usual, I watched the movie, then read the synopsis. Thank you! Ah, in fact there are some English subtitles! I guess it’s too late now, but here’s a link to them. I don’t speak Spanish either, though I can pick up bits and pieces. Brilliant deconstruction, thanks for posting!